When it comes to electric scooters, kids would definitely go for cool looks or some custom colored LED lights… Right! But, you can’t let them pick one up only on the basis of looks as there are many other things to consider while buying an electric scooter for your kid. Of course, you don’t wanna waste your money by picking up the wrong one. So, you need to buy an electric scooter that has both good looks and great features. It must be lightweight as your kid would be using it yet it needs to be durable. You want good battery life and range too, and if you are on a limited budget, then you might want one that gives a great performance without breaking your bank. But, which electric scooter will actually be the best one for your kid when every company is claiming theirs to be the best? Your head might be spinning by just looking at so many options. But, don’t get worried because we’ve done the hard work for you. We reviewed some great electric scooters and made a list of the top seven best electric scooters for kids. Now, let’s take a look at feature overview of my Top 3 Electric Scooters For Kids. 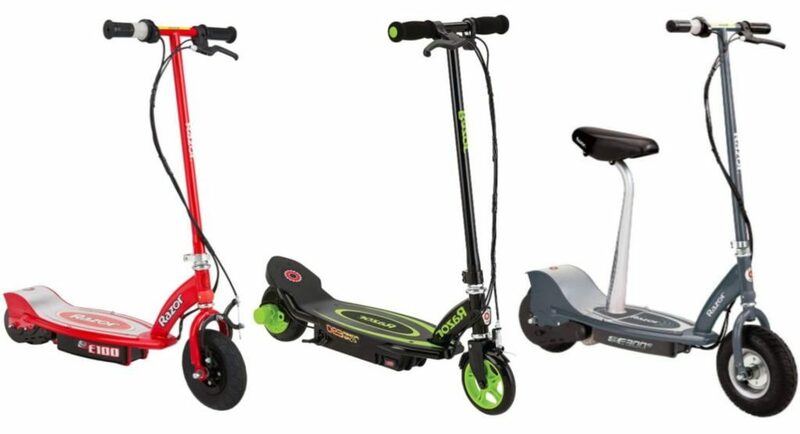 Furthermore our buyer’s guide and comparison table of kids electric scooters will help you choose the right one for your kid. So, let’s get started right away. Q: Can my kid take the electric scooter out in the rain? Q: Is it safe to leave my electric scooter on charging overnight? Q: Are pneumatic tires better or rubber tires? Q: Are all electric scooters for standing ride? 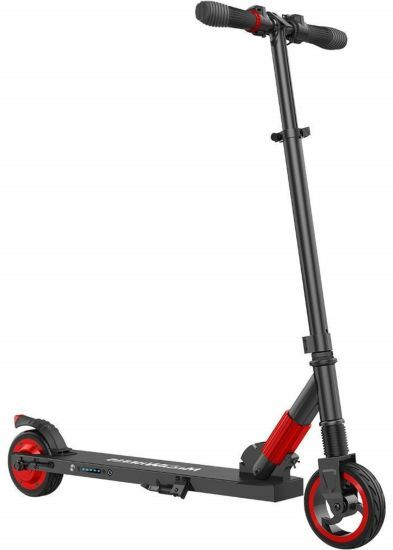 First up on my list is the Razor E100 Electric Scooter and it certainly had to be the first one. I put it up on number one because it literally had everything that you would want your scooter to have. Good range, outstanding battery, lightweight, a variety of colors, cool looks, low price; you name it, and it has it. So, it’s a complete package in an extremely decent price range. Now, we all are well aware of Razor and their fabulous rides. 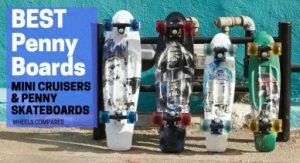 They have everything in the store from low price electric scooters to high priced ones and that too without any compromise on the quality. This goes without saying that they are our favorites when it comes to electric scooters which is why you’ll find many of their scooters in our list. 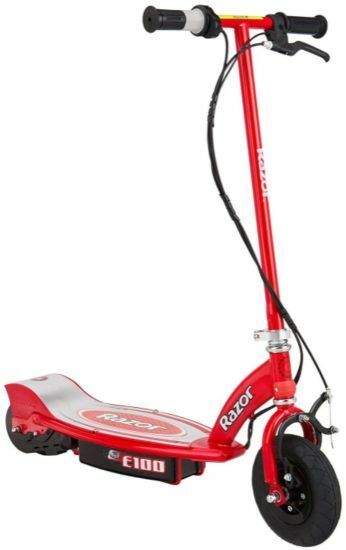 So, let’s get on with the Razor E100 electric scooter which is for kids aged eight or eight above. It has a really cool look and what is best is that it comes in so many colors and if your kid is a Hello Kitty fan then they have that in store too. Whether you want a blue one for your boy or a pink one for your baby girl you won’t have any problem finding one. The top speed it gives is 10 mph which is just perfect as it’s neither too slow nor too high for your kid. Your kid will be able to ride it for consecutive 40 min, but when practically it was tested, it gives much more range than this. It will go for straight one hour with a single charge. What more can one get at this price range? AMAZING… Right! The front wheel is bigger and is air filled, so it absorbs all the shocks and bumps on the road very effectively. The rear urethane wheel is smaller than the front one. The battery is pretty great, and it will last for an hour whether you are riding downhill or uphill. As per the manual, you will need to charge the battery for 12 to 18 hours before the next use but the recommended charging time is 24 hours. Moreover, unlike other electric scooters, it does not make much noise thanks to its chain driven motor that is very quiet. So, let your kid enjoy riding the E100 while you take some nap or watch TV. The E100 weighs about 30 pounds which makes it very suitable for kids and makes the handling easier and safe. The acceleration controls give your kid a better grip over the scooter, so you don’t need to worry much about your kid’s safety. As for the cons, I couldn’t find any significant one. Still, I think the braking system might be a problem if your kid is not well aware of steering the bike, particularly at higher speed. But once your kid gets a grip over electric scooter riding and handling, then you won’t be having any problem to deal with. Nevertheless, I think one cannot complain when the value for the money is this good. I personally think that this bike is a complete package and I would recommend it to anyone any day. The value for money is through the roof. Everything this electric scooter offers says MORE. So, let your kid have fun on this one and that too without going over your budget. Like the E100, Razor E200 is also a great scooter by Razor. It’s also an electric scooter that won’t break your bank thanks to Razor’s affordability. There are small differences between E100 and E200, but it’s the little things that create the difference. But the braking system E200 has is definitely a big difference. So, let’s see what this one offers. The Razor E200 has a top speed of 12 mph, and the range is 40 mins. This one will give you exactly the range that has been stated, not more than that like the E100 does. The battery used in this electric scooter is a 24-volt seal battery system that requires 12 hours to charge, but I would recommend charging it even more than that. You can even charge it for 24 hours because it might improve the performance of your scooter. Unlike the Razor E100, this model is not available in different colors yet; it looks cool so your kid will like it. The rear and front wheels are large 8-inch tires and are air-filled which help your kid enjoy a smooth ride even on bumpy tracks. Now, this one weighs about 38 pounds and is suitable for kids aged 13 above. It also has the chain driven motor which is very quiet so no complaints from the neighbors. The real deal is its braking system as the stopping power is INSANE. The brakes will stop your scooter instantly. I would recommend that you should really get a good grip on the brakes before riding at high speed. Press the brakes slowly and a little before you actually wanna make a stop so, you can make a stop smoothly. Well, I found that it is heavier than it looks so, your kid might not be able to hold it alone, and you will have to give a hand. 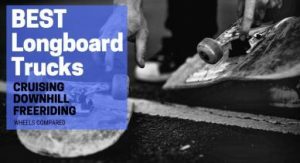 The brakes might startle you when you use them for the first time, and you will have to press them slowly, so you don’t fall off. But its definitely not a con, it’s just something that you have to get used to. I first thought that there should have been a variety of colors to choose from, but after seeing the price tag, I knew I was extremely ungrateful. If your kid is 13 above and craves for some speed, then you should go for this one. 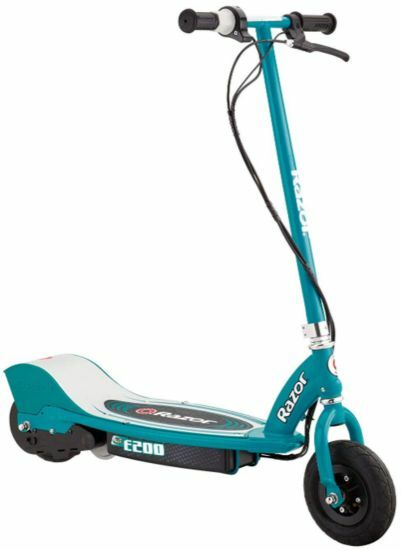 But, if you know that your kid will give quite a beating to the scooter and there will be rough handling, then no other scooter beats the durability of E100, or you can select some other scooter from our list that has a steel or aluminum frame. On the other hand, the E200 has some great power and acceleration yet, is very safe to ride thanks to its braking system. Now, If your kid has a grip on riding electric scooters, then this one is a go-to electric scooter. It is Razor’s one of the speediest electric scooter, and your kid will surely have a hell of fun with this one. The seat makes the scooter both comfortable and safe to ride. So, this one has a top speed of 15mph which is by far Razor’s best speed for kid’s electric scooters. Kids definitely enjoy having a speedy ride and looking cool and all. But, speedy doesn’t mean that it’s not safe, it definitely is. It’s extra wide 10 inch tires are the real heroes. These extra big pneumatic tires not only provide greater stability for a fast ride but they are also great on muddy or rough paths. They won’t wear out easily, and you won’t feel any jerks or bumps. What else one needs… Right! One thing that makes this one stand out is its detachable padded seat. I really like it as it makes riding very convenient. Sometimes, your kids get tired of standing so; this is a great option. You can attach the seat if your kid wants it and just remove it when he or she wants to ride standing. This one also has a kickstand. The range is 40 minutes which is the same as the E200, but practically the E300S will give you five more minutes range with a single charge. The charging time is also the same as the other batteries and don’t get confused with the green light. Even if the light is green, you should get your scooter on charge for more than 12 hours, and if you can do it for 24 hours, then that would be even better. The thing I like about this one is the color range. The colors you can choose from are great. They have pink, blue and grey so, your kid can choose one easily and as to their liking. While going up a hill, it might tend to get slow, but as it won’t stop so, I think it’s not pretty bad. As many expensive electric scooters stop entirely while riding up a hill so, this one only getting slow is not a big deal. The batteries are the lead acid batteries that are outdated, and I’ve seen people complaining about it. If you ask me, I don’t think of this as a big problem unless they are working fine. And you can always replace your batteries which will cost you just a few dollars. All in all, it’s a great exchange for money. Its tires and speed make it stand out. Moreover, it has a seat to that you can attach or detach your kid likes, however. The braking system is also great, and the colors that are available make it even more suitable for your kid. The Razor Power Core E90 is most suitable for longer rides or when you are out camping with your kids for days. It is light and portable and needs no maintenance which makes it ideal to use. The Razor Power Core E90 has a top speed of 10 mph, and its range is 80 mins. This range is what makes it stand out as it is two times more than what any other electric scooter offers. So, your kid can have fun riding it without you worrying about charging the battery again and again. This one is ideal for taking out for longer rides or when you go camping with your kids. It weighs only 22 pounds which is extremely light, and you can take it with you anywhere you want. Even in hilly areas it is pretty ideal to ride because it is powered by a power core hub motor. This motor ensures that you can go uphill or downhill with ease. The frame is made of steel and is pretty durable. It is also available in different colors so, you can buy whichever color your kid wants. The thing I prefer about this electric scooter is that it does not require any maintenance. You can not believe this… Right! But Yes! It actually does not need any maintenance, all thanks to Razor for not using any chains or chain tensioners in this particular one. As for the cons, the motor is pretty noisy, but that is because of the reasonable price if it would have been quiet then that would definitely have added some more dollars to the price tag. So, one cannot complain about a noisy motor with this price range. Personally, I felt it is a bit too slow even for a kid. It would have been a prize if Razor had offered a good speed with such a good range. Nevertheless, if you are a safety freak, then you might be okay with this speed. I think that it really shines as far as the range and lightweight is concerned. The no maintenance thing also makes it pretty ideal. But, if you specifically want these things or you are fed up of your electric scooter demanding to charge every 40 minutes, then you are good to go with this one. If this is not the case, then there are many other options out here. You know when your kid is totally into looks and wants a cool looking electric scooter well we know the hustle. But the Razor E100 Glow has got you covered as it lives up to its name and actually glows. So, you can get your kid a cool and lit electric scooter without going over your budget. So, this electric scooter really shines when it comes to looks. It has LED lights that will glow whenever your kid twists the throttle. It feels amazing to hear that Right! But it feels even more AMAZING when you actually see it all glowing up. The top speed is 10 mph, and the range is 40 mins like most of the electric scooters offer. It weighs 32 pounds, and the frame is entirely made of steel which increases its durability. The front tire is 8 inches and is air filled, so it absorbs all the shocks and makes the ride very smooth. The battery charges in about 12 hours but as already mentioned the recommended time for charging the battery is 24 hours. So, I would always recommend charging the battery for more than 12 hours, and if you can give it 24 hours to charge then, that would be the best thing. Other than its looks, most of the features of this electric scooter are same as the other scooters. The speed is not impressive, but of course, for an 8-year-old it is quite safe. The battery used in this one is the old school sealed lead acid battery but you can replace these whenever you want, and it won’t cost you a fortune. All in all, this electric scooter looks really cool and is also not heavy on your wallet. So, if you want your electric scooter to stand out among the crowd with the lit LED light, then you should really go for this one. 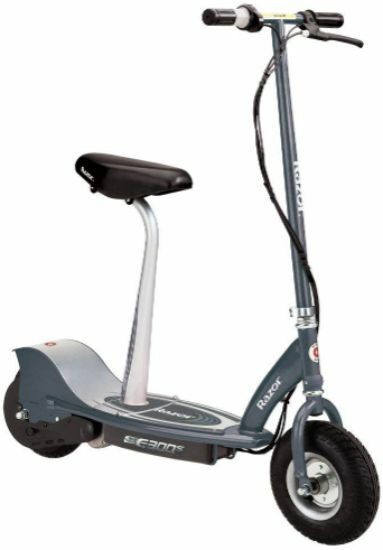 We all know that Swagtron is well known for its high quality and durable products and the Swagger Classic electric scooter is no exception. It offers many great features and is ideal to take with you on a family trip as it is very portable and does not take up much space. Swagtron always has something good in store and same is the case with the Swagtron Swagger Classic electric scooter. This one will take you at an amazing top speed of 15.5 mph, and the range is also pretty great that is 9 miles with a single charge. 22.5 pounds which make it extremely light to carry around. The cherry on top is that it is foldable and so, you can just put it in the back of your car and cruise around whenever or wherever you want. It actually maintains its swag with a front LED light. So, if your kid wants to ride his or her electric scooter under the starry sky at night then you can easily let them do it as the front LED will light up your kid’s path. The wheels used on the Swagtron Swagger Classic are solid rubber tires that mean you don’t have to worry at all about any flats. So, whatever the road conditions, the tires will glide through it. The Swagger’s battery charging time is just 5 to 6 hours. Your kid won’t have to wait an entire day to ride his electric scooter again. The frame of this one is made of aluminum alloy, and the black color looks really cool. So, what else one can dream of when you are getting such a great and complete package. I personally, would recommend it to people who frequently take their children on family trips or for camping. It is because this one is ideal for such conditions. It really performs well while going uphill and won’t slow down as the other scooters do. The rubber tires are great because they don’t get flat and require no maintenance, but on a bumpy road, your kid might experience the bumps and jerks. The air filled tires are comparatively more shock absorbing. But well, who wants to deal with flat tires… Exactly! No one. I don’t like the branding done on the scooter, putting the entire name of the brand on the scooter was not necessary. But if your kid does not mind that, then it’s completely fine. Otherwise, a little spray paint or some tape would do the task of covering it up. The Swagtron Swagger Classic is best if you want a portable electric scooter that you can easily take around for your kid. And if you are tired of changing flat tires and checking the tire pressure every now and then, then this is it. The Megawheel S1 is a portable electric scooter that can be folded so that you can take it along with you anywhere and the height is also adjustable. Its stopping is a great deal thanks to its double braking system. Let’s get to its features. This electric scooter will take you at a top speed of 14 mph, and the range is 5 to 8 miles. Whether you get 5 miles range or more than that will, of course, to depend on your child’s weight and where you are riding the scooter. If you are going up a hill which requires much power, then you will have a shorter range. Still, even 5 miles is a pretty good range. The motor used is quite a powerful one, so it will take you up to moderate hills or inclines. The double braking system provides the required stopping. The frame is made of aluminum alloy which makes the Megawheel S1 super light. I think this one shines when it comes to its portability as it is super light and is foldable. So, it won’t take up much space, and you can always keep it in the back of your car or any other vehicle. Other than this, I also like the fact that it is quiet, even quieter than the Razor E200. While testing it on hills, I was surprised because with such a great motor I expected more power. But, it won’t go up a very steep hill, and on moderately inclined hills it tends to slow down. Its battery system is a bit annoying because sometimes even when you have 3 bars left, the scooter shuts down. But other times it shuts down at two bars which are normal. If you are looking for an electric scooter for your kid that you can always keep in your car and is very portable then, you can consider this one. Now, that you know which are the best electric scooters for your kid, you have to make the final decision. But for that, you need to be careful of some things. It is because even if you know what your scooter offers, the features and performance vary depending on the conditions. So, you have to keep in mind a few things before deciding which scooter you will buy. You should be aware of where your kid will ride the electric scooter, how long your kid will ride the electric scooter, how your kid will handle the scooter and is your kid more into riding the scooter or just likes the whole look of it. All of this goes without saying that you have to keep in mind your budget. So, let’s get on with this and make the final decision more easier for you. 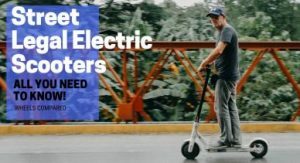 We have listed down electric scooters with lower speeds, higher speeds and those with moderate speeds too. So, it all comes down to what you prefer. 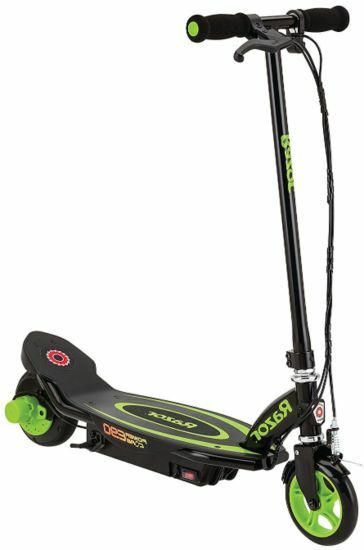 If your kid is 8 years old and you don’t think it would be safe for them to ride at higher speeds, then you can choose an electric scooter with low or moderate speed like the Razor E100 or the Razor Power Core E90. But if your kid can handle a bit high speed but you still are concerned with the safety of your child then you should go with the Razor E200 that has moderate top speed. On the other side, if your kid is aged 10 above or is a teenager, then you should definitely let them have some fun and go with the higher speeds. 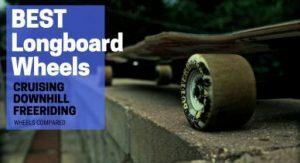 For that, you can choose the Razor E300 S or the Swagtron Swagger Classic electric scooter that is quite ideal, specifically for teenagers. I always put these two together because the range and battery are interdependent. So, you will get a good range when the battery is good. But, it really depends on the weight of the rider and where you will be riding your electric scooter. If your kid is a bit heavier, the range will decrease, and if the conditions where your kid is taking the electric scooter are rough, it will also reduce the range. So, keep that in mind as these factors matter most when it comes to the range. If your kid is taking the scooter for just some fun riding on the pavements and all, then you might not want much range. And if you are sure that your kid would be riding only on the plain surfaces, a range of 40 minutes would be more than enough. 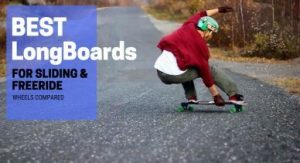 But, if you will be taking the scooter along with you on camping and on trips where you are not sure about the conditions, and most likely there will be terrains and rough conditions than choose a scooter with a good range like the Swagtron Swagger Classic or Razor Power Core E90. In addition, if your kid is a bit bulky then, get an electric scooter with a good range, and if this is not the case, then you can get any range you prefer, and that is within your budget. Here, I would like to tell you that most of the electric scooters in our list have a charging time of 12 hours and more. But I’ll personally suggest that you should charge the scooter for 24 hours for the best results and improved performance and battery life. And don’t get confused with the green light, even when the green light appears to keep the charging on for 24 hours. Whereas, we have the Swagtron Swagger in our list too which charges in 5 to 6 hours so, if your kid can’t wait for enough you can go with the Swagger Classic. You will find electric scooters with two types of tires; one are with pneumatic or air-filled tires, and the others are with rubber tires. Choosing which tires will be suitable for you depends on where your kid will be riding the scooter. If it will be a rough place where the tires tend to get flat, then I would recommend getting the Swagtron Swagger Classic as it has rubber tires and you won’t have to worry about flat tires or air pressure. But air-filled tires are best when you have to get on bumpy roads as they will absorb all the shocks and your child will have a smooth ride. For that, you can get the Razor E200 or the E300 S that has large pneumatic tires. 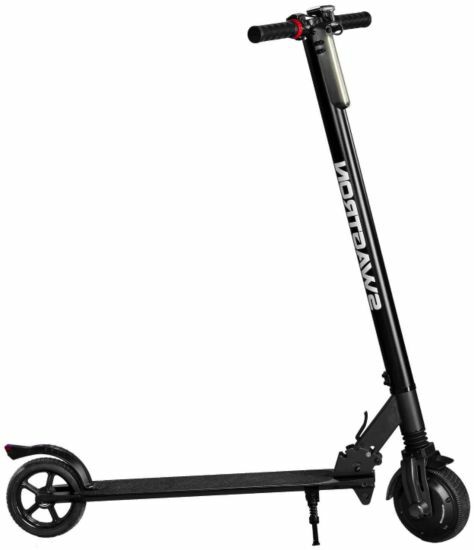 Sometimes, all you want is an electric scooter that you can just throw in the back of your car and take along or anything that is light enough to carry around easily. So, we have many options in our list; you can choose foldable electric scooters like the Swagger classic and Megawheels S1. The Razor Power Core E90 is very light in weight and just weighs 22 pounds so you can get that one too. As, these are electric scooters for kids, so we know how much kids crave for cool looks and those fancy LED lights. So, we’ve got you covered on that. 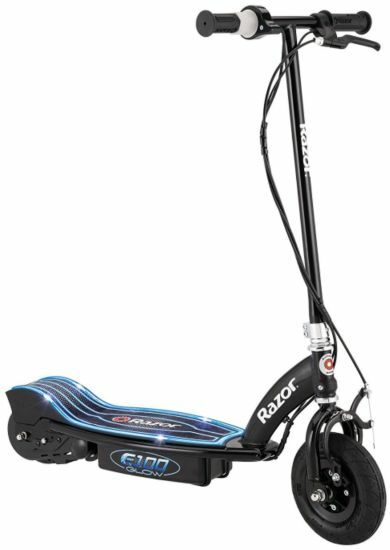 I would definitely say the best one in looks is the Razor E100 Glow and it is also reasonably priced, so it’s a great exchange for money and will make your kid really happy. Other scooters are also no less; there are many great options for you in our list, in terms of color range, LED lights and cool frames so check them out and choose whichever your kid prefers. When it comes to the price, it totally depends on your budget. We have some great options that definitely won’t break your bank and will give you the best performance. To cut it short, I would say that all the Razor electric scooters have a very decent price and value for the money is through the roof. So, the Razor scooters won’t be heavy on your pocket. The others are also reasonably priced as we have tried our best to include the scooters within a particular budget. A: Yes, of course, your kid can take the electric scooter out in the rain. Electric scooters might have motors and batteries, but they are packed inside the base of the scooter, so you don’t have to worry about that. A little drizzle won’t do any harm but just to be on the safe side don’t get them all dispersed in some water hole or something like that. Otherwise, you are good to go. Q: Is it safe to keep my electric scooter on charging even when the battery displays green light? A: Yes, it is completely safe to keep the scooter on charging even with the green light. As I already mentioned in buyers guide that it is recommended to charge the battery for 24 hours. So, even if green light appears after 12 hours of charging, keep the charger on for complete 24 hours. But, after 24 hours don’t forget to unplug the charger because you don’t want to overdo it. A: Always check on the manual or confirm from your seller about the recommended battery charging time. If it is 12 hours, then it is recommended to charge the battery for 24 hours, and you can definitely leave your scooter on charging overnight. But, some electric scooters have 5 to 6 hours of charging time. For such scooters, it would be better not to exceed that limit and not leave them on charging overnight. But do confirm it from the manual or from the company. A: This totally depends on where you will be riding your electric scooter. If your kid is riding on a bumpy road, then pneumatic tires are better at absorbing all the shocks on bumpy tracks. But, if the path is stony or rough and you don’t want to deal with flat tires, then you can go with the rubber tires. So, it all comes down to what you would be comfortable with. A: No, there are many seated electric scooters too. It all depends on what you want. If your kid likes to ride electric scooters while standing, then you have got many options out here. But, if your kid would like a seated electric scooter even then, we have an option for you. Razor E300 S seated electric scooter has a padded seat. The best thing is that you can detach the seat whenever you want. So, your kid can ride it while standing or sitting. However, he or she likes. I hope this list will be helpful in taking the right decision and the buyer’s guide will further make things easier for you in buying the perfect electric scooter for your kid. All the electric scooters on our list are great in terms of performance, and the prices are also pretty decent. We have placed all types of electric scooters in our list so that you can choose one according to your liking. Whether you want a budget scooter or you are okay with paying a bit high price, whether you want an electric scooter with pneumatic tires or rubber tires, you want pink color or blue color, a seated electric scooter or adjustable handle, LED lights or cool black frame; you name it, and we have taken care of all your demands and wishes. So, buy your kids these electric scooters and see them having fun because at the end of the day it all comes down to enjoying your ride. If you have any queries or suggestions feel free to talk about that in the comments section. Have fun with your electric scooter and don’t forget to share your experience and which bike you will be choosing for your little one.